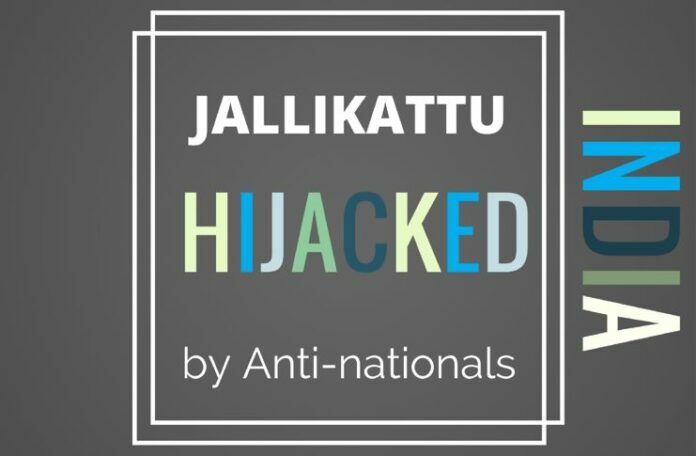 In the garb of fighting for Jallikkattu anti-nationals appeared to have hijacked the movement. In the garb of fighting for Jallikkattu anti-nationals have hijacked the movement. As this post was being readied for publishing, news comes that all agitators have been evicted from the Marina and some have been indulging in Arson and setting fire to vehicles. Anti-India slogans, anti-RSS and anti-BJP slogans, placards “featuring” pictures of Narendra Modi with a garland of foot wears and protesters dressed as the Prime Minister, chief minister O Panneerselvam and AIADMK general secretary V K Sasikala engaged in obscene actions are what which catch the attention as one takes a stroll along the road adjacent to Marina Beach. Nobody could explain why big photographs of Osama bin Laden and Palani Baba, the slain founder of Al-Umma and Velupillai Prabhakaran are displayed so prominently along the beach. At no pointy of time, these “leaders” had propagated Tamil culture or tradition which are always against killing or paining one’s rivals. Nobody could answer the question who is offering biriyani, bottles of mineral water, biscuits, bed rolls to the thousands of “protesters’ who are staging a sit-in at Marina Beach since last Wednesday morning, demanding the lifting of the ban on Jallikattu imposed by the Supreme Court. A Christian girl in black costumes, who is a familiar face in evangelical get-together meetings, was seen shouting at Prime Minister Narendra Modi for the ban on Jallikattu. Though the government of Tamil Nadu promulgated an ordinance for the smooth conduct of the 2017 edition of Jallikattu, the demonstrators (which include tiny tots to octogenarians) refused to wind up the agitation and declared they would disperse only if a permanent solution to the rural sport was brought in by the government. That stance along with the slogans demanding release of Cauvery Water, discontinuation of National Eligibility and Entrance Examination, freeing the assassins of Rajiv Gandhi serving life sentence in various jails in Tamil Nadu and creation of a separate Eelam in Sri Lanka, prove beyond any doubt that this agitation is not for Jallikattu but for creating chaos, confusion and conversion among the people. The entire-process of the sit-in got a fillip with 24X7 news channels which are starved of contents parking their satellite news gathering vans along the beach and telecasting the demonstration live with multi-camera units. A Christian girl in black costumes, who is a familiar face in evangelical get-together meetings, was seen shouting at Prime Minister Narendra Modi for the ban on Jallikattu. It is doubtful whether this over-enthusiastic activist has seen Jallikattu even once in her lifetime. Team PGurus has been steadfastly highlighting the significance and importance of this traditional sport in Tamil life. But the slogans against Prime Minister Modi, the RSS and the BJP who are in no way connected with the Supreme Court ban on Jallikattu were being done with ulterior motives was picked up by our team of reporters and correspondents scanning the Marina Beach as well as other venues in the State. The demonstrators as well as the leaders who mobilise and manage the crowd forgot the fact that TV cameras, CCTVs and mobile phones could pick up the video and audio of all what they are showing and shouting. Moreover, the government of Tamil Nadu and the Central government have arrangements and system to monitor the demonstrations and keep a tab on the managers of this kind of mobilisation. A widely respected journalist like Prakash M Swamy with nearly four decades of sparkling and unblemished track record in covering news and political analysis was forced to come out in the open and tell that this agitation was nothing but a secessionist movement. The outpouring of reactions received by Team PGurus with reference to the previous revelation that Churches and NGOs were behind the agitation are the fall out of the lamenting by people who are caught with their trousers down while they are engaged in illegal activities. The standard style of these kind of demonstrators or protesters or letter writers is to generalise it as a Sangh Parivar propaganda and condemn it as lies and falsehood. Interestingly, these “activists” have no answer for slogans on the release of Cauvery water by Karnataka, demand for separate Eelam in Sri Lanka and release of the assassins of Rajiv Gandhi serving life imprisonment during an agitation for Jallikattu. A widely respected journalist like Prakash M Swamy with nearly four decades of sparkling and unblemished track record in covering news and political analysis was forced to come out in the open and tell that this agitation was nothing but a secessionist movement. “I would like to see Prime Minister Modi take control of the situation and deal this issue with an iron hand,” Swamy said after a visit to the protest sites at Marina Beach. Even school children could tell that the Tamil Nadu government came forward to promulgate an ordinance because it could not do anything more than that because the Supreme Court is seized up of the matter. But the demonstrators remained adamant and wanted a permanent solution then and there at the Marina Beach which gave out their real intention; chaos, confusion and conversion. Union Minister Nirmala Sitharaman, had told at Mahabalipuram on January 13, 2016 that Tamil Nadu government should promulgate an ordinance for conducting Jallikattu and the Centre would offer all support for such an ordinance. By Sunday evening the fissures within the demonstrators came out in the open with a Tamil pop musician, spearheading the agitation going public telling that the protests have served the purpose as the government has done whatever it could be done. Continuation of the demonstration was tantamount to contempt of court as well as spreading anarchy in the society, he said. Meanwhile many RSS activists who were staging the demonstration were seen disbursing as the stage was ready for the 2017 Jallikattu. Dr Subramanian Swamy, senior BJP leader, who had told the Tamil Nadu people that I the ideal way to circumvent by the 2014 Supreme Court ban on Jallikattu was to approach the court again with a modified plea after removing the bulls from the list of performing animals. They did not heed to Dr Swamy’s suggestions and even launched a campaign to discredit him by spreading lies and falsehoods against him. At no point of time Dr Swamy uses obscene words against anybody. Even his enemies will agree that he is moderate with his words and never discredits anybody. The only time the senior BJP leader gets annoyed is when someone asks him for his reaction to comments made by K Veeramani, an anti-national of the highest order and owner of Periyar Maniyammai Private University. “He is not K Veeramani but Porukki Veeramani,” Dr Swamy says. Veeramani, allegedly a loudspeaker of DMK president Karunanidhi and a political Sakuni is known for his demand for secession from India and his association with all anti-social and anti-national elements. Even known critics of Jallikattu are of the view that the Governments of India and Tamil Nadu have done the best they could do under the prevailing circumstances. Interestingly, the agitators are not aware of the news that it was the BJP-led Union Government which had been advising and counselling the Tamil Nadu government to promulgate an ordinance for conducting Jallikattu. Union Minister Nirmala Sitharaman, had told at Mahabalipuram on January 13, 2016 that Tamil Nadu government should promulgate an ordinance for conducting Jallikattu and the Centre would offer all support for such an ordinance. But the then government of Tamil Nadu did not heed to that counsel offered by no less than Sitharaman, an efficient and intelligent minister in the union cabinet who is known for her erudition and articulation. What Panneerselvam did on January 21 2017 could have done one year back which would have seen Marina Beach available for the regular morning and evening walkers of Chennai. The Jallikattu fans, by staging the demonstrators, had given enough fuel to PETA, crying for the abolition of the rural sport. Two persons were gored to death by the charging bulls and 53 persons injured seriously in Puthukotta district during a Jallikattu event inaugurated by Tamil Nadu minister Vijaya Bhaskar. This is known as “playing into the hands of your enemies”. PGurus should publish images/audio/video they say they have and publish it openly and identify the trouble making characters. It’ll put to rest most of the questions on authenticity of the write up above. If you can publish the IT docs related to NDTV issue, why not publish relevant material in this case? As they say, a picture speaks of 1000 words, a video clip will narrate a story of its own. Why the hesitation on the part of PGurus to publish it? As always a truthful analysis and article from you my friends. You are doing a great job. I will always read up PGurus .com first before proceeding further. Thanks a million. You are dishonest with truth, foget that this was leader less movement and only issue has been to facilitate the rural sport. The kind of feelings generated among even government employees says it all. If you want to discredit any movement say Christians and other religious minorities plus dalits and obcs are behind it. Excluding that much of population from the mainstream and labelling all of them as anti-nationals definitely comes with closed mind approach. Please do not become a laughing stock among rational people. STALIN AND OTHERS. INITIALLY, THE MOVEMENT WAS PEACEFUL. EVERYONE SUPPORTED IT. AGITATION HAS EARNED A BAD NAME FOR THE GREAT TAMIL NADU. You must be a Karunanidhi Chella!! huh? Only Tamil People know the truth!! A small issue was made into a cultural issue and then it became fight between the tamilians and rest of the Indians!! This proves Education doesn’t necessarily gets you common sense.